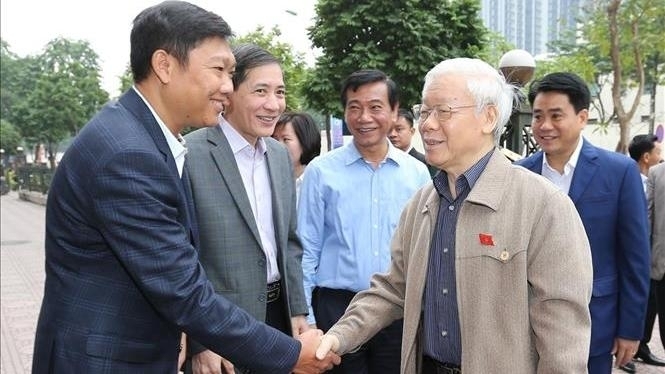 Party General Secretary and President Nguyen Phu Trong met with voters in Hanoi’s Ba Dinh, Tay Ho and Hoan Kiem districts on November 24, to inform them of the outcomes of the recent sixth session of the 14th National Assembly. The majority of voters said that the content of the session reflected democracy and responsibility, adding that reforms in the meeting have helped to improve the operational quality and efficiency of the legislature. Congratulating the Party chief on his election as President, the voters expressed their wish and belief that the leader would successfully fulfill the tasks assigned to him by the Party, the NA and the people. They suggested conducting votes of confidence at candidate registration and work places, in addition to legislative meetings, to ensure objectivity and accuracy of the work. NA deputies should meet voters in their residential areas and work places to discuss specific topics in order to understand their aspirations, they said. The voters proposed enhancing the inspection of the implementation of the Party’s resolutions, and noted their wish that the Party and State would continue with their anti-corruption efforts. Regarding the issue, Party General Secretary and President Trong emphasised the need to turn words into action. The leader agreed with the voters’ opinions on the responsibility for setting examples of officials and explained that the vote of confidence aims to prevent bad deeds among officials. He echoed their views on the need to step up information work to raise public awareness of the Comprehensive and Progressive Agreement for Trans-Pacific Partnership (CPTPP), which was approved during the sixth session. It is a must to intensify thematic supervision in socio-economic issues and inspection at different levels to prevent bad deeds, which, the leader said, needs a comprehensive plan. At the meeting, the voters also applauded and showed their support for the Government’s drastic and effective solutions to manage the national economy and ensure social welfare. They expressed their hope that the Party, State and NA would create breakthroughs in 2019 to make the country develop comprehensively and affirm its role when joining the CPTPP.